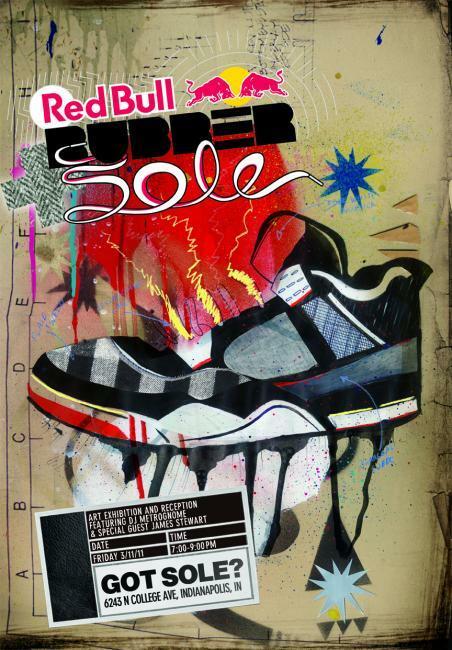 Red Bull Rubber & Sole is a shoe design contest featuring artwork from seven designers hailing from Indianapolis, Detroit, Chicago, and St. Louis. Each design will be on display at the got SOLE? Boutique during the Red Bull Rubber & Sole exhibit. Designers utilized James Stewart as the inspiration for their artwork, which includes a design on the sole of the shoe. Stewart will be in attendance to view the designs.